Looking for a ten minute filler activity today while we waited for guests to arrive for Toby's birthday tea party, I thought this would be a fun way for the boys to get involved in party preparation. It was very simple and satisfying to do. We used digestive biscuits, but any plain bought or home made biscuits/cookies will do. I initially thought we would make Christmas themed biscuits, but the boys had other plans so we went with what they wanted to do. Toby chose the colour he wanted, so I helped him make up some pink icing using icing powder, water and red food colouring. I made it fairly runny so it would drizzle easily from a teaspoon. If you want to flavour the icing you could add lemon juice instead of water, or a few drop of flavour essence. 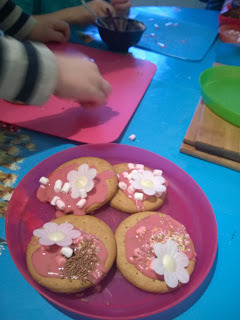 The boys spooned icing on to the biscuits, then decorated them with sprinkles, mini marshmallows and some rice paper flowers I had left over from a cake we made earlier in the year. They really liked this activity because they could complete almost everything completely unaided and produce something really pretty and tasty to share with their friends. Great activity for developing fine motor skills, creativity and self esteem.